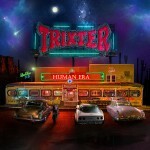 Share the post "Album review: TRIXTER – Human Era"
Trixter’s moment in the spotlight at the turn of the nineties was fleeting. No sooner had the New Jersey youngsters begun to make an impact with a series of catchy if unoriginal songs and photogenic videos, then grunge revolutionised the musical landscape and the bottom swiftly fell out of their chosen market of glitzy pop metal. After their second album, 1992’s ‘Hear’ they were dropped quicker than a falling stone. However after reforming in 2006 the one tie boy wonders are now onto a second reformation album and enjoying a second crack at the (not so big) time. Rather refreshingly, rather than disown their younger days, their musical style has not evolved too much from a tried and tested path. Indeed opener ‘Rocking to the Edge of the Night’ is an excellent anthem combining the best moments of Bon Jovi, Firehouse and Van Halen which it is not hard to envisage as a potential 1980’s MTV favourite. In a similar vein ‘Crash That Party’ has the snot nosed attitude of an early Skid Row and ‘For You’ the rapid fire fun feel of Mr Big or Van Halen. However the most repeated comparison is to prime time Bon Jovi, especially the vocal phrasing, on the likes of ‘Not Like All the Rest’, ‘Good Times Now’ and ‘Every Second Counts’, the latter with its U2 influences sounding like an outtake from the Keep the Faith era. Indeed my favourite track on the album, ‘Midnight in Your Eyes’, with its who-oahs, almost outdoes cult Jovi copyists Blue Tears. The pace only really varies a couple of times- ‘Beats Me Up’ is a fine ballad driven by a mixture of acoustic and electric guitars and another that surely would have attracted the MTV schedulers first time round and the superb ‘Soul of a Lovin Man’ allies their melodic hooks to a deep bluesy feel in the mould of Whitesnake or House of Lords, indeed a little too closely to ‘Fool for your Lovin’ for comfort. The title track closes the album with another instantly catchable hook and what seem to be autobiographical lyrics about growing older and wiser. Peter Loran’s clear, powerful vocals and the musicianship on show are uniformly excellent. The songs are consistently strong yet my one criticism would be that they lack a distinct signature sound, hence the ease with which I found myself making comparisons to other bands. This entry was posted in ALBUM REVIEWS, ALBUM REVIEWS (Mobile), All Posts and tagged hard rock, melodic rock, Peter Loran, Trixter. Bookmark the permalink.